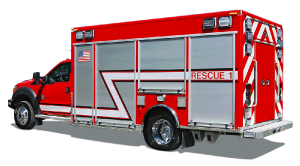 NEFEA is a distributor of Rescue 1 slightly used stock and demonstrator units. Anything you see for sale on Rescue 1 is available for purchase by calling us and requesting more information. A Rescue 1 is more than just a shiny polished truck. It’s an extreme duty, custom-made tool that’s dependable and built to provide a lifetime of services. Each rescue is handcrafted with exacting precision by a dedicated team who takes great pride in every vehicle they produce. They have remained a stable, reliable company over the years and has maintained our vision as an independently-owned, customer-focused designer and manufacturer of high-quality custom emergency vehicles.